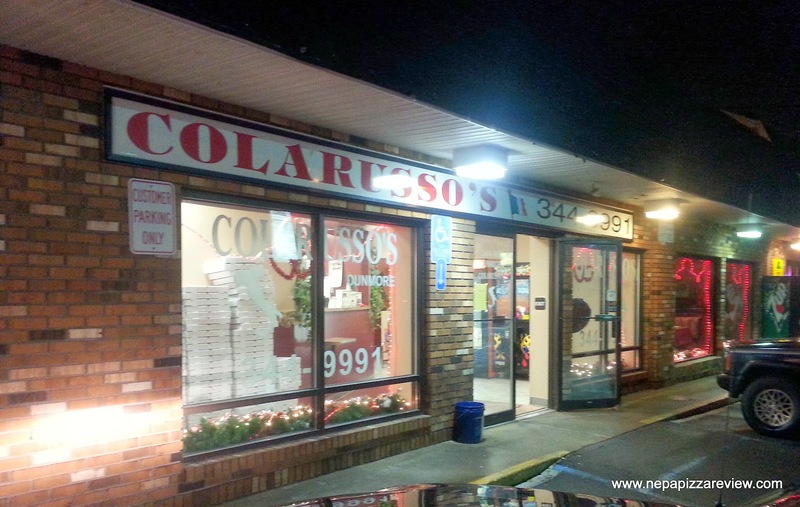 The Colarusso name is very prevalent in Northeastern Pennsylvania and I have never met a Colarusso pizza that I didn’t enjoy. I didn’t learn that there was a Dunmore location until recently when I texted a buddy asking for suggestions where I could get pizza in Dunmore that I haven’t tried yet. He directed me to Colarusso’s and Calabria’s as they were right across the street from one another. Since they were so close together, I decided to do both! Based on his recommendation, I called Colarusso’s for takeout, and decided to eat in at Calabria’s. When I walked into Colarusso’s, I saw why he recommended this place for takeout, because it primarily looks like a takeout joint with its large windows and takeout counter greeting you as soon as you enter. There is a small dining room with about 10 tables, which is totally sufficient for dining in, but this location is definitely the smallest of the Colarusso’s that I have been to. 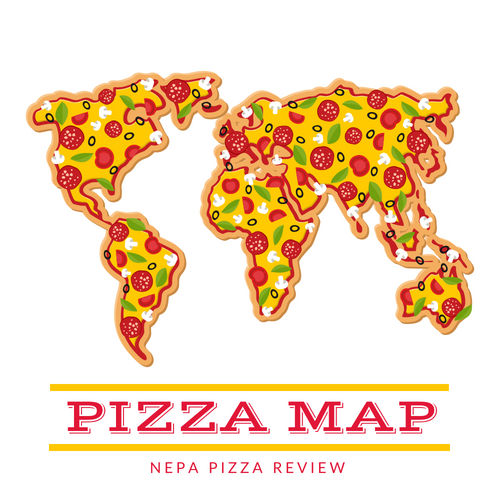 Of course, I have no idea which location is owned by whom, so maybe comparing various locations is not fair, but the name is certainly the same and the menu is very similar to the Clarks Summit and Jessup locations. Because I’ve reviewed two other Colarusso’s Old Forge red pizzas at other locations, I wasn’t too interested in another one on this night. 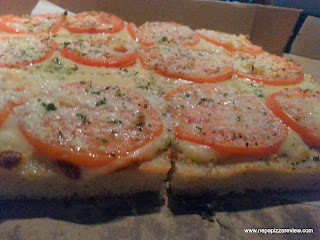 Plus I wanted to promote what I consider to be one of the better signature pizzas in NEPA that I have enjoyed for years, and that pizza is the tomato and garlic white pizza. So I ordered a ½ tray of tomato garlic pizza, and the lady on the phone told me I could pick it up in a half an hour. It was ready in just under the prescribed time, which I appreciated. While I was waiting to pay, I took a peek over to the drink refrigerator and noticed that they stored their pizza shells in there. There were precooked shells, but more importantly there was fresh dough pressed out in the pans which provided definitive proof that Colarusso’s creates their own fresh Old Forge shells! Ok so you aren’t as excited as I was, but this is a big deal to me! After grabbing the box, I scurried back to the pizza mobile and opened the box to photograph the pie. 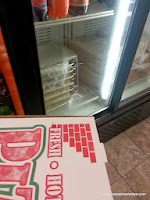 What I found was exactly what I have come to expect from the other Colarusso’s locations which have served me the same exact pizza – a perfectly cooked, expertly prepared, and amazing looking tray. The smell of the garlic and parmesan on top was intoxicating, and I couldn’t wait to give this a try. The first bite netted an explosion of flavor and one of the most tender old forge crusts I’ve ever experienced. This crust was totally fresh, fluffy, crispy on the bottom, and delicious – it had all of the attributes of a great old forge crust. 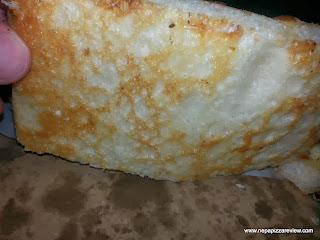 The cheese was delicately melted, gooey, and slightly browned in areas – just how I like it. The tomatoes were sliced very thin, but thick enough to add moisture and flavor to the mix. In a related note, the tomatoes are eerily easy to eat compared to some tomato pies which one bite removes the entire slice of tomato and makes a mess. There was a lot of garlic on the pizza, which I loved, but those of you who aren’t garlic lovers might want to skip this pie or choose another. This pizza really wallops you with flavor, so if you have a bland pallet, this pizza is not for you. The flavors, however, are completely in balance and in tune with one another. The seasoning, garlic and parmesan combination is wonderful and compliments the savory crust and gooey cheese. I really couldn't ask for much more, and this was exactly what the doctor ordered. That's one thing about all of the Colarusso's locations that I've tried - they are very consistent. The pizza is almost always the same. Sure, every pizzeria has an off day, but I've eaten Colarusso's probably 50 times in my lifetime and I don't recall catching them on a bad day. For that reason, I recommend the Dunmore, Clarks Summit, Dickson City, and Jessup locations! Check out my other reviews to see what I have to say about them!